We Don’t Just Clean Your Home, We Detoxify It! Nurturals’ products are developed from nature to nurture you and your life. All of our products have 100% naturally derived ingredients, with no VOCs, no chlorine bleach, no synthetic fragrances or dyes and is phosphate and gluten free. All of our products are safe and naturally wipe out bacteria, germs, grease, grime and tough stains! Our products do not contain any synthetic fragrances, dyes, parabens, petroleum solvents, alcohol, sodium laurel/laureth sulfates or ethoxylates. The Nurturals formula was originally used to clean wildlife affected by oil spills. It also works great as a de-greaser, bathroom, kitchen and all purpose cleaner. This product is great for people living with pets, allergies, asthma and the desire to live a chemical free lifestyle and detox their home! 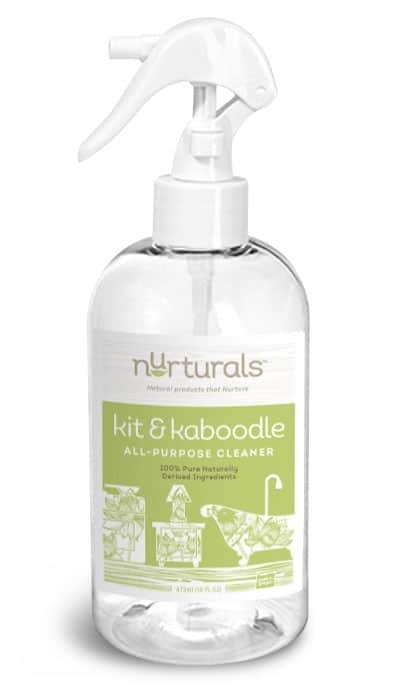 Our signature Nurturals “Kit & Kaboodle” All Purpose Cleaner was created by the owner & founder of Maid to Shine. She wanted a natural cleaning product that would be 100% non-toxic and safe for her staff to breathe on a daily basis, she also needed something that would be 100% safe around kids & pets as well as safe for all surfaces in the home, but most of all EFFECTIVE at removing germs, bacteria, viruses & odors, thus her line of “Nurturals” all natural cleaning products were born! All of our products come naturally unscented and can be custom scented per our clients preference, therefore we can offer you an aromatherapy cleaning experience which can be customized to your favorite scent or scent blends using our line of Nurtruals Organic essential Oils. Our products are extremely earth friendly not only because they are 100% non-toxic & plant based, but also because we use a concentrated formula to refill all our 16oz spray bottles, therefore we are not throwing away thousands of spray bottles each year, we reuse all our spray bottles by refilling them with our signature Nurturals Concentrate.One 16oz bottle of our conctrate will refill our spray bottles up to 96 times! Another cool fact- all our labels for our bottles are printed on a material called BioStone, which is fully biodegradable & is made from 100% stone. Click here to learn more or to purchase this product for yourself or a friend! 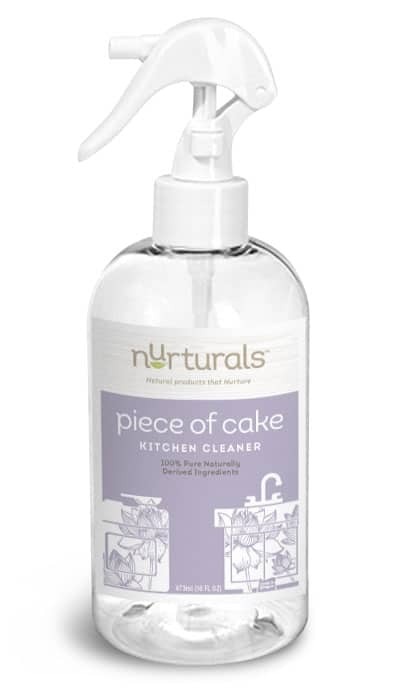 Our Signature Nurturals”Piece of Cake” Kitchen Cleaner is similar to the above Kit & Kaboodle cleaner, except our kitchen cleaner is formulated to be slightly stronger than our all purpose cleaner to help de-grease stove tops and remove stuck on foods from the counter tops. All our products are 100% food safe and can be used to clean counters, cutting boards, sinks, etc without having to worry about toxins or harsh chemical getting into your food & then ingested. Our products are literally edible and are not harmful in anyway; we even sell them to restaurants who use them to de-grease & clean their fryers! 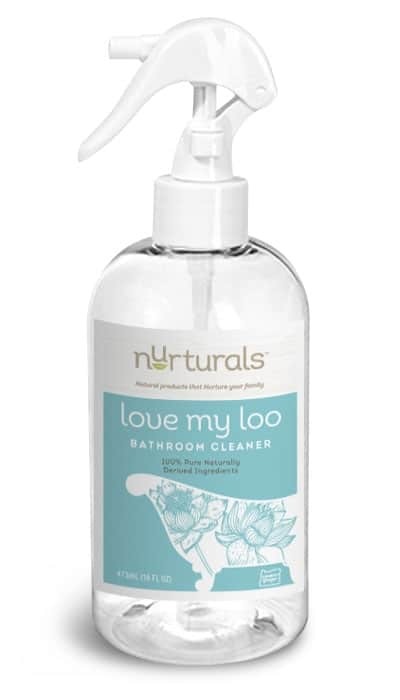 Our Signature Nurturals “Love my Loo” Bathroom Cleaner is similar to the above products, with a sightly different formula strength to combat germs, bacteria and viruses in the bathrooms as well as tackling soap scum in tubs & showers. Our Nurturals cleaning products are so effective at removing heavy grease (soap scum too) we sell our products to saw mills to be added to the mill ponds to clean the saw blades and renew the water in the ponds by emulsifying the oil and grease so the pond waters are safe to put back into the soil. 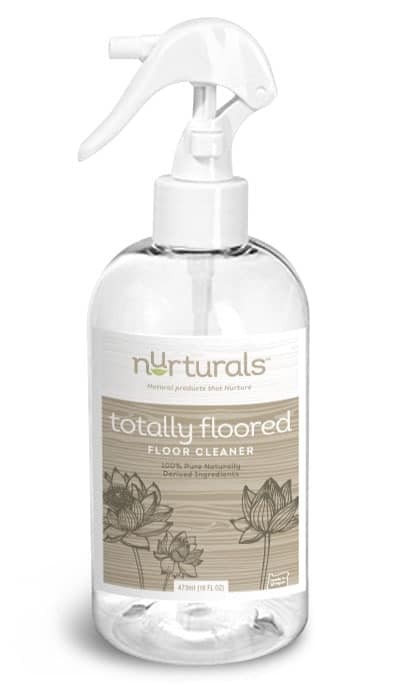 Our Signature Nurturals “Totally Floored” Floor Cleaner is similar to all the above products with a lighter strength formula to be used on all sealed floor surfaces including hardwoods, laminate, vinyl, tile, granite, etc. This product was designed to leave all types of floor surfaces squeaky clean! We are not kidding when we say the floors will literally squeak after they are mopped- this product is that effective! Basically our floor cleaner goes deep down into the pits and small holes of your floors and “pops out” the grease and dirt like a ball bearing! The wonderful thing about our floor cleaner is that if your pet walks across the recently mopped floors and then licks their paws they will not get sick from ingesting the floor cleaner! Something to be aware of is that most floor cleaners have toxic chemicals that are very disruptive to your pets health, so it is always important to read labels and ensure you are not causing undue hardship for your pets health & lungs. We use our own organic line of essential oils to scent all of the above cleaning products! The wonderful benefit of our product is that they come naturally unscented therefore we can clean “scent free” if that is your preference or we can custom scent them to your liking with our Organic essential oils. Imagine walking into your home after a long hard day at work and opening the front door to the delightful scent of Lavender & Peppermint permeating throughout your home! After a clean by Maid to Shine, you will feel as though you just walked into the spa! We believe all our clients deserve a “spa-like” relaxed feeling when they walk through their front doors to see everything in the house sparkling and the air naturally clean and detoxed! Don’t be fooled by other cleaning products that leave your home smelling like a public restroom “air freshener” most fragrances in other cleaning products incorporate chemicals called phthalates. They’re a class of synthetic chemicals, and they’re almost everywhere you look today. There are more than two dozen different types of phthalates commonly used by the chemical industry. One of their uses is in fragrances, where they stabilize synthetic perfumes. If the cleaning product you have in your hand says “fragrance” on the bottle, it pretty much means there are phthalates in there. Phthalates can be carcinogenic — which means they can cause cancer. 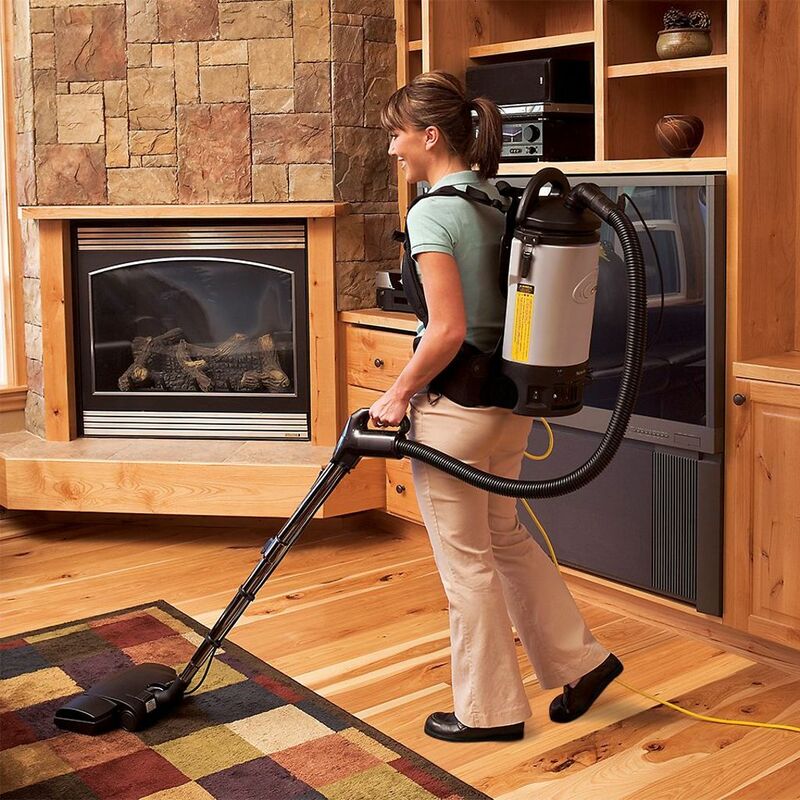 Our Proteam Anti-Allergen vacuums are superior! They use a Four Level Hepa Filtration system, that captures 99.9% of dust mites, pollen, bacteria and other particles measuring 1 micron and larger. The Sierra has earned the Gold Seal of Approval/Green Label from the Carpet and Rug Institute, signifying the vacuum system meets higher standards for carpet cleaning effectiveness and indoor air quality. It also meets the requirements of the U.S. Green Building Council’s LEED rating system for Green Cleaning – Sustainable Cleaning Equipment. Our professional grade eco-friendly Microfiber cleaning process is leaps and bounds better than any other cleaning method! Using this high quality dusting process ensures the surfaces in your home are free from dust, germs, bacteria, allergens, finger prints and sticky residue. Using the Super Silk Wiper to buff areas dries ensures a shiny, streak-free finish on your furniture and counter tops. Scientific info behind our microfibers: The PerfectCLEAN microscopic triangular fiber (4-6 microns) traps and removes bacteria (2-8 microns) and other harmful microbes. 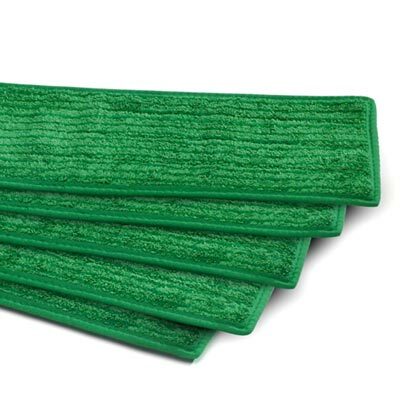 Our bicomponent split filaments are highly absorptive and hold a positive electrostatic charge to attract dirt, dust, bacteria, pollen, and other negatively charged organic particles. Built-in Antimicrobial Protection PerfectCLEAN can eliminate 99.99% of bacteria from hard surfaces. Percect Clean wipers are the only microfibers that has been issued worldwide patents for built-in antimicrobial protection. We use the most effective, healthy and environmentally sound methods for cleaning all glass & mirror like surfaces! For Glass & Mirrors we do not use any harsh chemicals such as Windex or aerosol glass cleaners because they are toxic to your health and end up creating a buildup on the glass which traps more dust therefore causing streaks & an unsightly outcome! Our Glass cleaning methods consist of the following two protocol: For small mirrors and glass surfaces we use a damp microfiber cloth to clean the glass and then buff dry with a Patented Super Silk Wiper, this allows us to clean the glass perfectly without using any chemicals – only water! 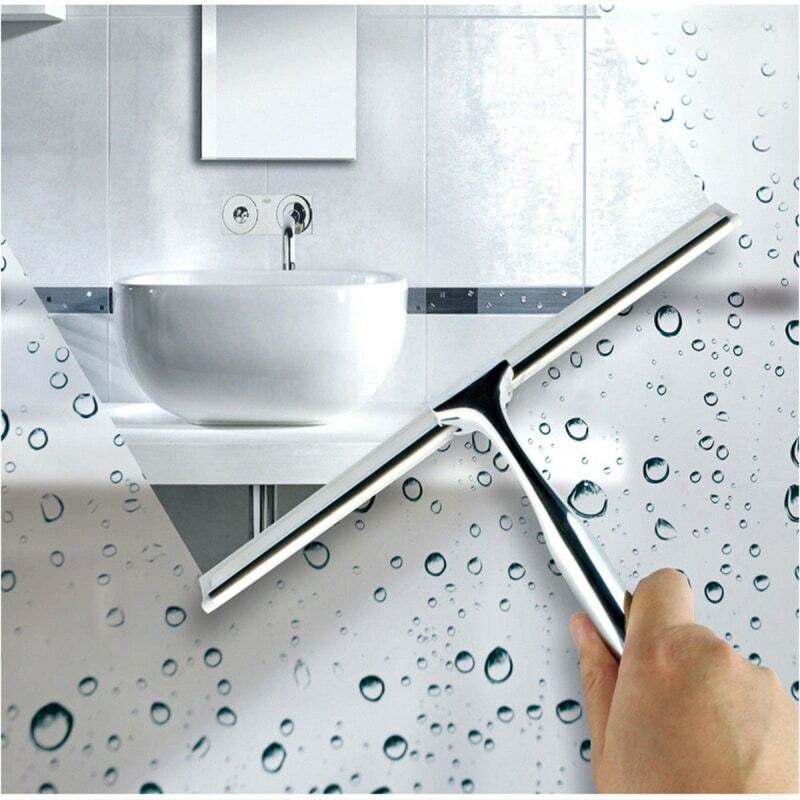 For large or very dirty glass & mirrors we use a professional grade squeegee with a tiny bit of dish soap, this helps break down all the dirt, grease & grime so the squeegee can remove it in just a few strokes! This professional method leaves mirrors extremely shiny and streak-free! 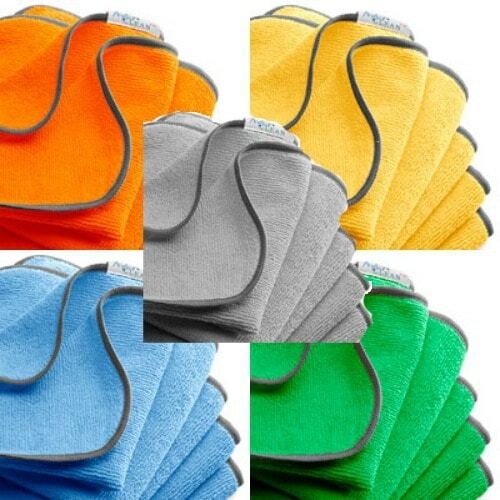 We use only high grade, anti-bacterial Perfect Clean microfiber flat mop pads therefore we can change out our mop pads between homes so germs, pet dander & bacteria are not being transferred from one home to another. Our Microfiber mops use low moisture therefore our mopping methods are safe on all types of floors including laminate & hardwoods. Scientific info behind out microfiber mopping system: Our Flat Mops offer the highest concentration of micro-denier fiber per square inch resulting in unrivaled performance while minimizing drag on all types of floor, wall, tile, and painted environmental surfaces. Performance criteria includes: highest percentage of “split” micro-denier fiber; the highest absorption capacity of any material tested; chlorine and dye stability; documented third party laboratory testing supporting the “Trap & Remove” performance standard. This patented material has the exclusive “built in antimicrobial product protection”. Maid to Shine Cleaning uses our own line of all natural, eco-friendly, non toxic cleaning products for the health of you and your family? These products are also available for our clients to purchase!